When I started to write this section of the article, I started on a pretty detailed piece. For the sake of brevity, I summarized most of the ideas. However, I’ve decided to post the original article on Medium pretty soon. If you want to be notified when it’s published, sign up for our blog newsletter. I’ve already blogged about it, but let me repeat the story behind Elokenz. During Summer 2015, I realized that most of my previous blogposts were slowly dying on my blogs. Few people were reading them anymore and they rarely got discussed on social media. So I wondered how I could keep sharing my blog posts for ever and ever… I felt that something was missing on the market (none of our competitors were existing at that time). I started to write an algorithm to share my own posts automatically on Twitter. Fast forward one year, during Spring 2016: I decided with Fanny, that Repost should be the first product built for Elokenz. During Spring and Summer we worked on the backend (coded in Django, a Python framework) and the frontend (coded in AngularJS). It took us three months to get something we called a beta. It was time for us to let the world know about it. In August 2016, our beta was proof-tested by a dozen friends. To get our first real users, we decided to share Repost on BetaList in September. BetaList is a platform that allows people to discover tools which are still in private beta. To leverage networks effects, we implemented an invitation system on Repost’s waiting list: people could get a Premium access to the tool if they invited friends. Well, you read correctly, among all the interested signups, few decided to signup when we sent the invitation email. Hopefully, we were only sending a dozen invitations per day in the beginning, so we quickly noticed that only 10% of people on our waiting list signed up. At this rate, we would have just a hundred active users with our list. So we decided to send one invitation + three reminders instead of just one invitation. This additional effort allowed us to reach a 30% activation rate. We came up to 300 active users with our waiting list. That was a massive lesson learnt for us. Never just send one email if you can set up reminders to increase conversion rate. After we started to send out invitations, users came on the website and tried it. Some mentioned it to friends or on Facebook groups. We started to monitor daily use in Mixpanel and to answer support messages in Drift. Very quickly after we sent our first batch of invitations, I discovered a user who had way too many articles in her Library. I was certain that she had found a bug allowing her to overcome the Free plan limit. When I checked over her activity, something surprised me though. It seems she was adding articles genuinely, not by using any bug. Weird. So I investigated even more to realize that she actually paid to become a Premium user a few days ago! At this point, we thought everything would be nice: we built it, they will come. We started to blog, to be active on social groups, to talk about the tool. But for a few weeks, our main source of users was the waiting list. As people haven’t heard of Elokenz a lot, we got a really low traffic and the signup rate was now about 10%. For a hundred visitors on our landing page, only a dozen would sign up. This is not a bad number per se, but you have to know that a signup is not equal to an activated user. At Elokenz, a user is activated when he connects a social network and creates his first Repost. Otherwise, it is a passive/dormant user. During the first months, our activation rate (from signup to activated user) was about 40% only. So, out of 100 visitors, only 10 would sign up, among those, only 4 would become active users. When you get less than 100 visitors per week, these are depressing numbers. Oh, I kept the best for the end. Three weeks after she paid for an Elokenz Premium account, our user contacted me to downgrade the plan. My confidence level dropped to 5% . Who said direct sales was easy? Ok, our first customer was not a good target, so I planned to go out and talk to potential customers on the phone, or directly at their offices. So I started to call and visit people in my target audience. I got massive insight about what people were looking for, and what to add to Elokenz to make it more appealing. I also learnt from Steli Efti (Close.io) that it’s better to sell even if you don’t have the features. That’s what I tried. And man, when you are an engineer like me without any real sales skills, this was hard. I think I closed my first customer in 3 or 4 weeks, despite knowing him for about 2 years. Closing in 3 or 4 weeks for a $100/year software didn’t seem efficient to me. So I decided to stop direct selling and went back to full-marketing strategy. 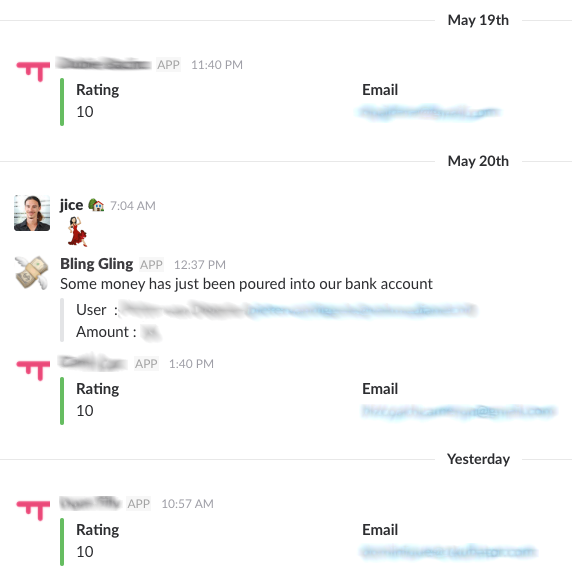 This is our Slack channel where users’ satisfaction (from 0 to 10) ratings are posted, and where we receive alerts when a new customer pays for a Premium plan. Who’s gonna be in charge of the product? We decided that Fanny will help me in the marketing (given her background and her design/communication skills). The problem was that Elokenz was not really production-ready. Someone had to take care of the technical side: fixing bugs, adding features and the likes. Long story short (you’ll find the detail on Medium): I spent 4 months looking for the good partner without any success. I shortlisted 2 potential CTOs, with great skills, but in the end no deal was made. I learnt a lot about myself during these months… and my conclusion was that it is hard to inspire people when your own situation is insecure (read next). When the second CTO-partnership failed, it was about March 2017. Fanny and I have been dedicating 100% of our time on the project since April 2016. 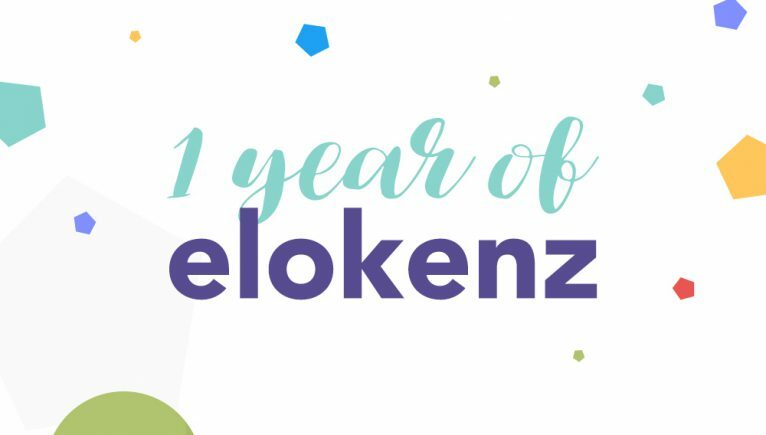 It had been almost a year, and Elokenz had only been generating $100/month until that date (yes, I have been generously providing discounts to our first customers). Nothing to be proud of. The tricky part was that I ran out of financial savings. I mean it. I couldn’t afford buying food or pay the rent of my flat. I had to rely 100% on my wife. Since December, I was telling to myself that I’ll be hiring a CTO, then raising funds and everything gonna be alright. But I knew it was a lie: even if we had found a technical associate, it would have taken 6 to 12 months to raise money. Fanny and I jointly decided to take a few-months break for the project. I would continue answering support tickets, but we would not work on new features or on marketing actions. During that time I took several freelance gigs and I applied for long-term jobs. However, the best deal for me was found around June when I approached someone pretty famous in the SaaS world, someone really smart that I hugely respect. He was looking for someone to help him on a part-time job about growth and marketing for SaaS. That we had new customers coming organically was amazing for me. It convinced me to continue. I now have the possibility to work part-time on Elokenz. We’re fixing bugs and adding features these days: I can say that the adventure restarted. In September alone we got 4 new customers and this is supporting us in the idea that Elokenz Repost is a much needed tool. VC funded startups mainly seek growth (over revenue and profitability). This explains why you hear so much about huge companies such as Twitter or Snapchat who have millions of users but have never (yet) been profitable. Their losses are compensated by potential future income. It’s a game number, you need lots of users to compensate for the huge charges your company is paying (employees, advertisement, …). In the opposite, Bootstrapped companies are seeking profitability first, then growth. The idea in general is that the product is generating a lot of value for its customers in the first place, and the profit is re-injected in the company (people, product) rather than growth (ads, marketing). So, instead of hiring more and more salespeople and buying more and more ads, a bootstrapped company will increase salaries and improve the product. As you probably understood, we are going to follow the bootstrapped scenario for the moment. This is not a deterrent to raise funds when this will be needed. Most probably we will seek/raise a hundred thousand dollars when we would be able to pay at least one full-time salary with our own revenue. Oh, Elokenz, my dear project. It seems to me that you have done your first baby steps and that you are ready to grow up now. I am pretty sure that most of the people who expressed their support and who shared good feedback about you are joining me to say “Happy Birthday“.